AS EARLY as 1966, the education commission chaired by D. S. Kothari had recommended that India should allocate at least 6 per cent of its national income to education. But till now, the allocation has not even touched 4 per cent. A study by Accountability Initiative found that India spends almost 2.5 per cent of its GDP on elementary education. This includes 0.71 per cent of private expenditure. 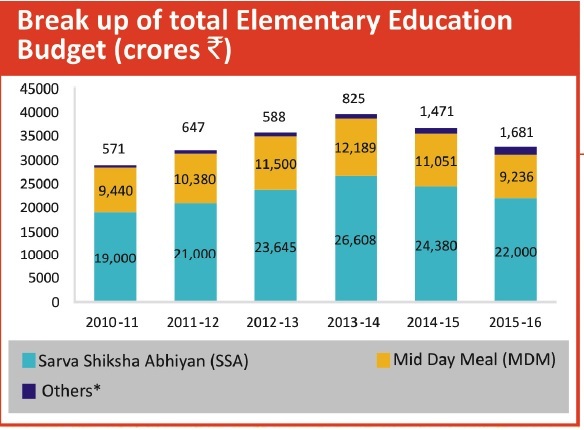 Sarv Shiksha Abhiyan (SSA), the flagship government programme on elementary education, got 67 per cent of the total elementary education budget in 2015-16 at Rs 22,000 crore. Besides the budgetary support by the Central government, 2 per cent cess on luxury tax paid by general public funds elementary education programme, Sarv Shiksha Abhiyan. Beginning with 50 per cent contribution in 2010-11, the education cess will form 90 per cent funding of the programme in 2015-16. In 2011-12, Uttar Pradesh had the highest public expenditure at Rs 18,126 crores, followed by Maharashtra at over Rs. 15,000 crores. On the other hand, smaller states of Himachal Pradesh, Punjab and Uttarakhand spent less than Rs. 2,000 crores. But when it comes to per student government expenditure, Kerala tops the list followed by Himachal Pradesh, Maharashtra, and Uttaranchal. High expenditure on elementary education per student leads to better learning outcomes but this expenditure is highly inefficient and needs accountability. 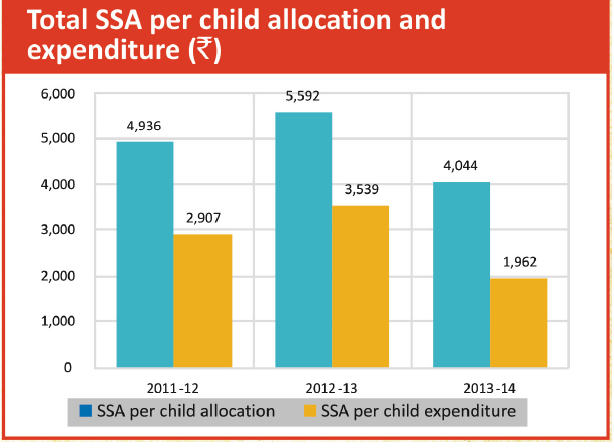 Annual median public expenditure per student attending government schools in India is Rs 12,768. Annual median expenditure by a family with a child attending government school comes to around Rs 446 since with implementation of the Right To Education Act, government schools no longer charge any fees, and provide textbooks and uniforms. On the other hand, annual media expenditure for a child in private school comes to Rs. 5,959. A 2013 study found that 36 per cent of the students at elementary level were enrolled in private schools. Of the 20 major states, 10 had more than half their students in private schools. In Kerala, 79 per cent students attend a private school. Both, Tamil Nadu and Maharashtra have 60 per cent students in private schools. In rural India, the percentage of children in private schools increased from 20 per cent in 2007 to 29 per cent in 2013 with states like Kerala have nearly 70 per cent of their rural children in private schools. Households are also spending on education beyond just school expenditure. Around 24 per cent of children in rural India attend paid tuitions. In fact, more than half the children in rural parts of Bihar, West Bengal and Odisha take paid tuitions. Households are also spending on education beyond just school expenditure. Around 24 per cent of children in rural India attend paid tuitions. In fact, more than half the children in rural parts of Bihar, West Bengal and Odisha take paid tuitions. Expenditure on teacher salaries constitutes the largest share of overall elementary education budget at state level. An analysis of elementary education budget of six states indicates that expenditure on teacher salary is at least around 60 per cent of total budget. In Rajasthan, share of teacher salary is close to 90 per cent. Expenditure on teacher salary is at least around 60 per cent of total budget. In Rajasthan, share of teacher salary is close to 90 per cent. States such as Bihar and Madhya Pradesh have higher proportion of para-teachers who are paid much lower than regular teachers. Para-teachers in Nalanda and Purnea in Bihar receive Rs 6,400-6,800 per month, while the regular teachers receive around Rs.23,000 to 28,000, on an average. Corresponding figures are around Rs. 6,000 and Rs. 17,800 for Sagar in Madhya Pradesh. This allows states to hire a larger number of teachers at much lower cost and also gives them some flexibility to spend on other components like infrastructure. Bihar and Andhra Pradesh spent a larger proportion of their education budget on school infrastructure at nearly 20 per cent. “I beg to place the following resolution before the council for its consideration.…the state should accept in this country the same responsibility in regard to mass education that the government of most civilized countries are already discharging and that a well considered scheme should be drawn up and adhered to till it is carried out..
Read more about Another brick in the wall?